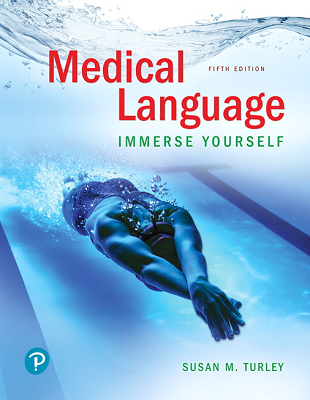 Medical Language: Immerse Yourself is grounded in immersive language learning. Rather than memorizing vocabulary, students experience the sights and sounds of health care as they listen, speak, write, watch, examine, and think. A greater quantity and variety of exercises than any other text maximize opportunities to reinforce learning. The 5th edition retains its organization by medical specialty – the way medicine is practiced in the real world. New to the 5th edition is a reorganization into 15 chapters, perfect for a 16-week course, and into five sections correlated with learning outcomes. Each section ends with new Practice Laps evaluating student competency and underscoring learning goals. MyLab™ is the teaching and learning platform that empowers you to reach every student. By combining trusted author content with digital tools and a flexible platform, MyLab personalizes the learning experience and improves results for each student. With MyLab Medical Terminology, students build a solid foundation of medical language through interactive games, Dynamic Study Modules, and narrated lectures. Learn more about MyLab Medical Terminology.